Follow up on policy actions, Complete Streets demo day, asthma awareness day, and more. The Senate Committee on Ways and Means just released their FY19 budget and it includes funding for key programs that impact health equity. Regional Transit: $88 Million, which is needed to prevent drastic cuts in RTA service, which would exacerbate existing inequities. Although this is good news for now, more advocacy will be needed during the budget conferencing process to support this funding. Keep posted for advocacy alerts. If you have not done so, take our Survey about how the transit cuts will impact you and learn how others are impacted. MA Food Trust Program: $100,000. This is terrific news and great momentum for the Massachusetts Food Trust especially given similar success in the House budget a few weeks ago. Healthy Incentives Program (HIP). The Senate Committee on Ways and Means included $3 million for HIP—a great starting number for advocates. HIP is anticipated to need $6.2 million in FY19 to be successful. Senator Anne Gobi will be introducing an amendment to increase the funding to $6.2 million. Action needed: call or email your senators and ask them to co-sponsor an amendment being introduced by Senator Gobi to include $6.2 million for the Healthy Incentives Program in the Fiscal Year 2019 budget. Amendment numbers have not been assigned yet, but we'll post it as soon as we have it. If they ask for the budget line number, it is 4400-1001. Find your senator’s contact info here. And when you call, remember to thank your senators for their support of the Regional Transit and the MA Food Trust. Join Dr. Matt Sadof, Sarita Hudson and other PVAC representatives on May 17th to present about asthma statistics in Springfield, progress made and strategies for the future. The hearing was prompted by the naming of Springfield as the most challenging city for asthma in the US. Come experience how Chestnut Street could be made safer for all! Enjoy some of Springfield's finest food trucks and best DJ, while trying out Springfield's new electric bikes, joining neighbors in advocating for safer streets, getting your bike fixed and much more! 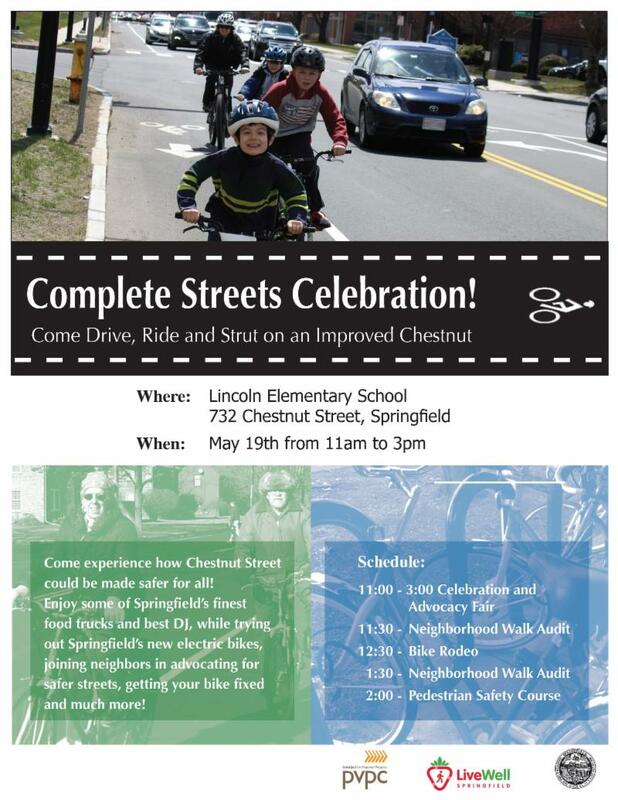 Masslive article: Lincoln Elementary School event in Springfield highlights benefits of sharing the road. May 29th - Celebrate Asthma Awareness Month in the "#1 Asthma Capital"
Did you know that Springfield is the asthma capital of our nation - the most challenging place to live with asthma? 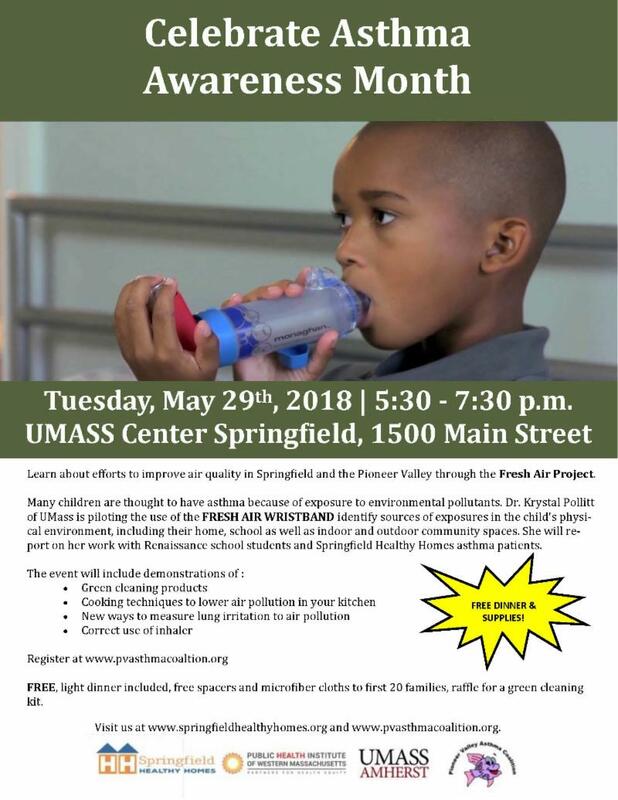 Learn about efforts to improve air quality in Springfield and the Pioneer Valley through the Fresh Air Project at our asthma awareness month. For more details, click here . FREE, dinner included, free microfiber and spacer to first 20 families.